If you’re acquiring a business or changing the way you operate, then you could be facing a TUPE situation when it comes to employees. Here’s our guide to the basics. 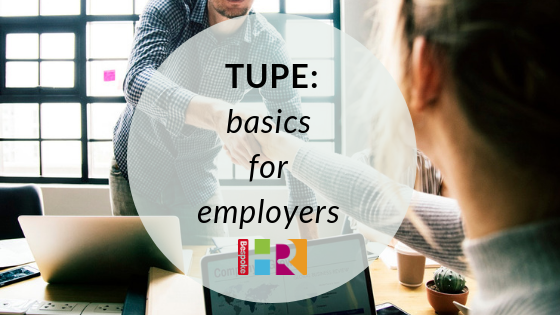 TUPE stands for Transfer of Undertakings (Protection of Employment) Regulations 2006″ and is designed to protect employees’ rights when a business or organisation they are employed by transfers across to a new employer or owner. This also applies when a company’s activities are out-sourced or brought in-house and when work is tendered out to contractors (moving from one source to another). TUPE does not apply to the sales of shares. The regulations were updated in 2014 and allow employees to transfer across without any changes to their employment terms and conditions. Business transfers: where a new employer is created, either from the sale of the old business or through a company merger. Outsourced work – when a service has been taken from an employee to a contractor. The old contractor passes on the work to a new contractor. The following questions help assess whether or not there will be a business transfer. Whether tangible assets such as premises, assets and equipment are transferred. Whether intangible assets such as goodwill and customer lists are transferred. Whether the majority of employees are taken over by the transferee and, if not, the motive of the transferee in not taking them on. The degree of similarity between the activities carried on before and after the transfer. Whether there has been any break in the performance of the activities. The extent of any disruption to those activities. (iii) activities cease to be carried out by a contractor or subsequent contractor on a client’s behalf and are carried out instead by the client on his own behalf (contracting-in or insourcing). How do you handle TUPE transfers? TUPE can be complex depending on the size and structure of the transfer, however in some cases its relatively easy to move across with minimal disruption. Employers should plan their TUPE process in line with the business objectives but aim to keep it simple and straightforward for staff. Legal advice is advised for incoming employers to make sure they are legally compliant and not exposed to risk. ACAS has some really useful information for employers, which breaks down the process into four stages and their obligations at each stage, including when and how to inform staff of the changes. Read our case study on how we helped business partners manage the TUPE process when purchasing a new business. We have a TUPE fact sheet available, please email us to receive a copy.